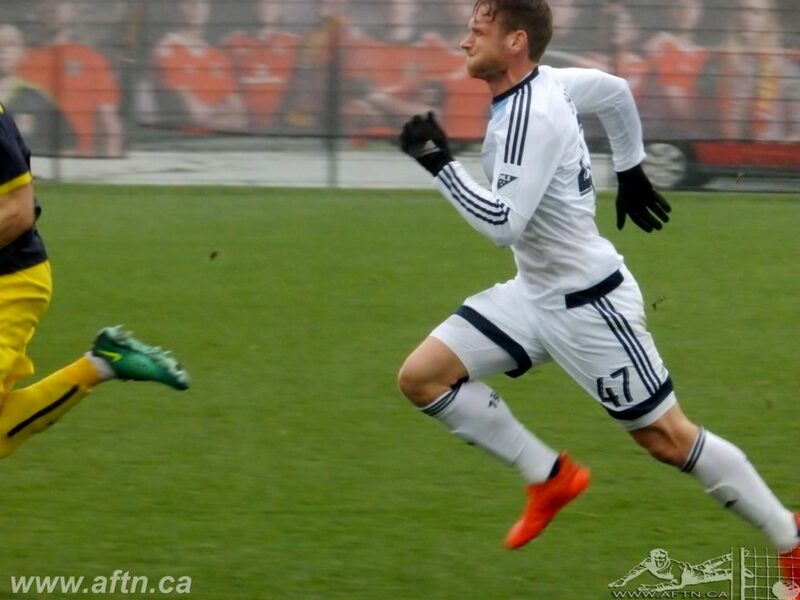 It’s been a wild and meteoric rise for Whitecaps striker Kyle Greig these past couple of seasons. April 4th 2015, and Kyle Greig was part of an Oklahoma Energy side that won 2-1 at Colorado Springs Switchbacks in front of just under 3,000 fans. Twelve months earlier Greig was scoring for the Energy in their 2-0 win over Orange County Blues in front of 1,221 supporters at Anteater Stadium in Irvine, California. His performances for OKC earned him a move to Vancouver and a USL contract with WFC2 last year, with an eye on a MLS deal if he performed well. He captained the team, leading them to the Western Conference final on the back of his 13 goals, earning him that first team deal this past offseason. On Wednesday night, he was coming on as a sub to play in a CONCACAF Champions League semi-final against players of the quality of Andre-Pierre Gignac and Eduardo Vargas. No matter how much self belief you have, it’s the kind of journey that still must make you pinch yourself a little bit. Greig knew he had what it took to make it to the top level of the game in North America, but when he was travelling around the USL, sometimes playing just in front of just a few hundred fans, he must never have thought that just a couple of short years later he’d be playing in such a massive game, against such top quality opposition. The Champions League, and the Whitecaps run in it these past few months, will always hold a special place in Greig’s heart and memories forever. He’d played a few minutes in the ‘Caps friendly against Crystal Palace in July, but Greig made his competitive first team debut for Vancouver in the team’s 1-0 win at Central FC, coming on as a 74th minute sub in Trinidad and Tobago as a WFC2 call up. He went on to make two more substitute appearances in the group stages of the competition for the ‘Caps, grabbing the assist on Alphonso Davies’ match winner at Sporting KC that clinched Vancouver’s quarter-final berth. 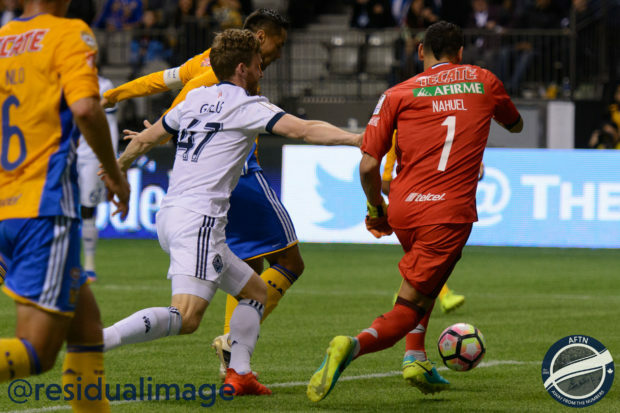 It was nearly an even bigger dream night for Greig late in the Tigres game as he tried to battle through a crowd of players to get on the end of what is hard to even call a half chance. Greig should get another chance to feed that hunger down in Sandy, Utah on Saturday evening as a tired and depleted Whitecaps side make the trip to take on Real Salt Lake in MLS action. He already offers something very different to what the Whitecaps other strikers can bring to the table – his height. At 6 foot 2, Greig is a towering presence in the box, with surprising deft touches for a big target man. He can also finish. 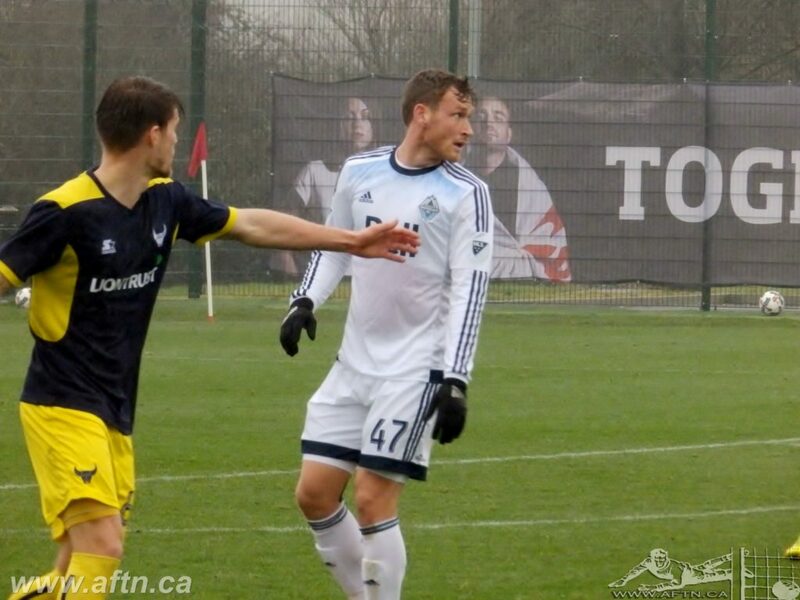 Greig got preseason minutes in Wales and in Portland, but started the season playing for WFC2 against in their season opening loss to LA Galaxy II. With Fredy Montero being the only other fit striker on the ‘Caps MLS squad right now, a huge opportunity now presents itself for Greig to go out and show Carl Robinson that he has what it takes to make it at this level, and stake a claim to not just a regular place in the gameday squad, but regular minutes as a potential game changing target man to bring on. “Definitely,” Greig said. “Early in the season it was a mental test for me. Just because in the last couple of years obviously in the USL, I was getting a lot of minutes. Coming in to this new group I had to take a new role, so to kind of have really grind it out each day in training, even though I wasn’t seeing minutes on the field, that was a big test for me. It’s hard not to expect that next opportunity to come on Saturday. Brek Shea’s knee injury in the early stages of Wednesday’s game against Tigres looks like seeing him ruled out now for around 6 to 12 weeks. Shea’s injury quickly comes on the back of Erik Hurtado’s foot contusion that he suffered in Saturday’s win over LA. Hurtado is at least out of his walking boot, but was still hobbling around on crutches on Wednesday night and will be out for several weeks as well. Those injuries, along with Yordy Reyna’s foot injury down in Portland in the ‘Caps last preseason match that sees him ruled out till the summer after surgery, decimates Vancouver’s striker and attacking options. Fredy Montero is still fighting to be up to full match fitness, starting on the bench last weekend against LA after picking up a slight injury in training the week before. It’s a nightmare scenario for Robinson, but out of one man’s night terrors comes another man’s dreams of delight. This really is the moment of opportunity for Greig. Montero has run himself into the ground in the three halves he’s played over the past week. The 90 minutes against Tigres will have taken a lot out of him both mentally and physically. As he still battles back to full fitness, it’s hard not to see him drop to bench on Saturday. That would just leave one true striker option for Vancouver in Greig. Robinson could go with the well rested Nicolas Mezquida or Cristian Techera up front, he’s done that in the past, but it would seem like a waste and Techera will likely get the rest treatment for the match anyway. And if Greig doesn’t get the start, he’ll almost certainly be brought on as a sub to make his MLS debut. However things pan out in Salt Lake, the big striker knows it’s another big milestone in his footballing career and one he feels he’s more than ready for.